This post is sponsored by The French Farm for #CookoutWeek. All opinions, as always, are my own. Creamy, tangy, Artichoke Garlic Potato Salad made quickly and easily with just a few ingredients. This potato salad is flavorful but not overpowering! Welcome to day 5 of #CookoutWeek hosted by The PinterTest Kitchen. You can read all about the participating bloggers, and find out more about the sponsors on my earlier post this week. 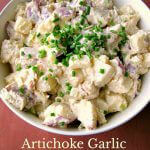 Finely pureed artichokes and garlic in a creamy sauce, it was just perfect for this potato salad! Neither the artichokes or the garlic are overpowering once mixed with a little sour cream and lemon juice. I used red potatoes in this potato salad. I never peel red potatoes in potato salad or mashed potatoes, I love the color the skins give, plus the peels have lots of vitamins. I chop my potatoes before cooking, but that’s totally up to you. 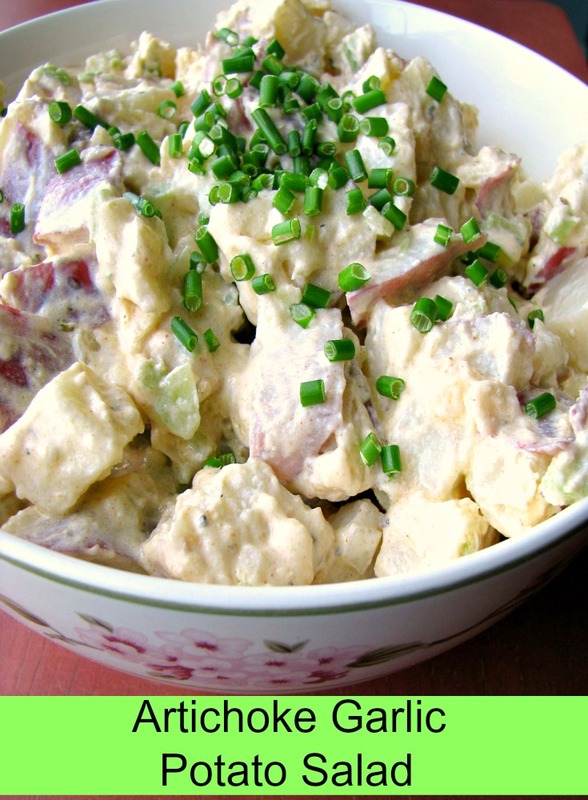 Red potato salad made with sour cream is my absolute favorite potato salad. I don’t need all the extras like pickles or eggs in my potato salad. I keep it simple enough, and then add an extra touch like I did here to make it special. I did the same with this amazing Avocado Sriracha Egg Salad. 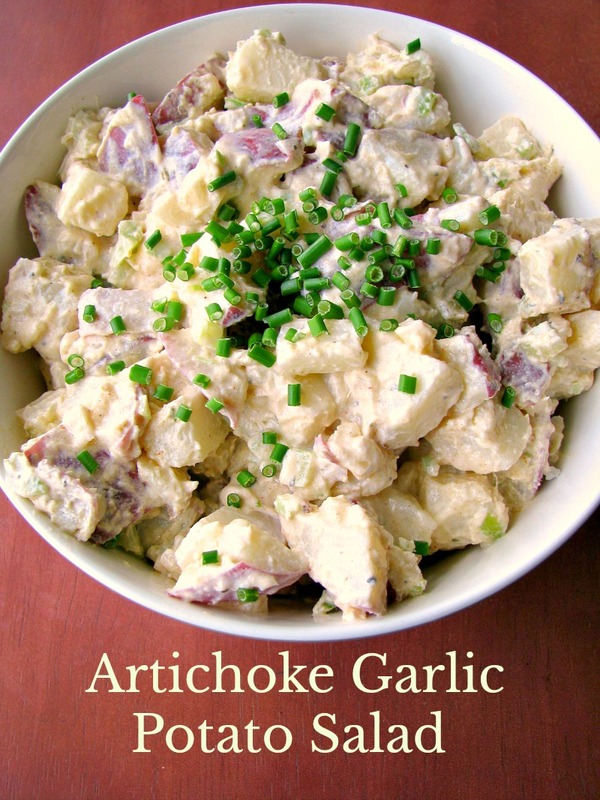 Read on after the recipe for Artichoke Garlic Potato Salad to see all the other great cookout recipes shared today. Creamy, tangy, Artichoke Garlic Potato Salad made quickly and easily with just a few ingredients. 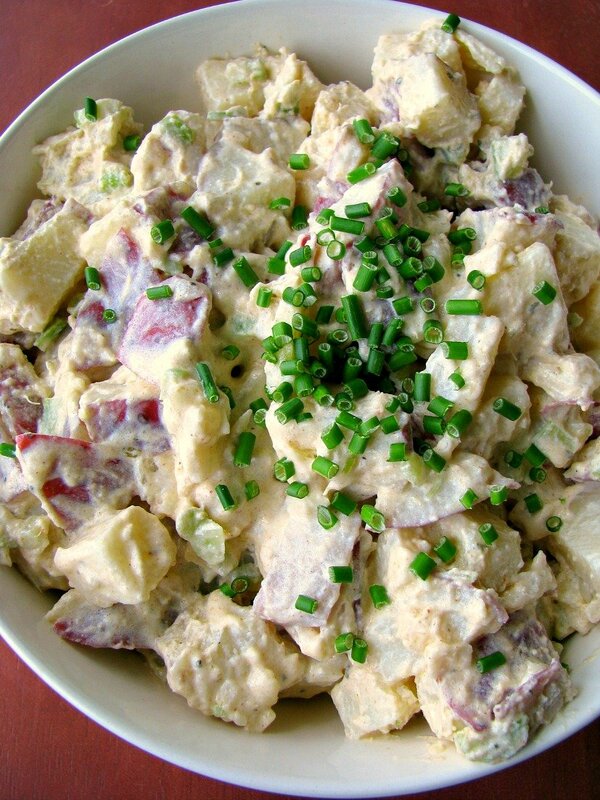 This potato salad is flavorful but not overpowering! Cut the potatoes into bite size pieces. Place in a large pot and cover with water, adding the tablespoon of salt to the water. Bring to a boil, reduce the heat and simmer for about 10 minutes or until the potatoes are soft enough to pierce with a fork. Drain and rinse until cold water until cool. Place the cooled potatoes in a mixing bowl, add the chopped onions and celery. In a medium size bowl mix together the sour cream, La Favorita Artichoke and Garlic Cream, lemon juice, paprika, basil, salt, and pepper; mix well. Pour the mixture over the potato mixture; mix well. Cover and refrigerate until well chilled. Love the addition of artichokes to this salad. Thanks, I love both artichokes and garlic, so this was perfect for me! I’ve never had artichokes in potato salad before but man do I want to try it now! Honestly, the artichokes are so fine that you can’t really taste them in the way you would artichoke hearts, but it gives the potatoes a unique flavor. 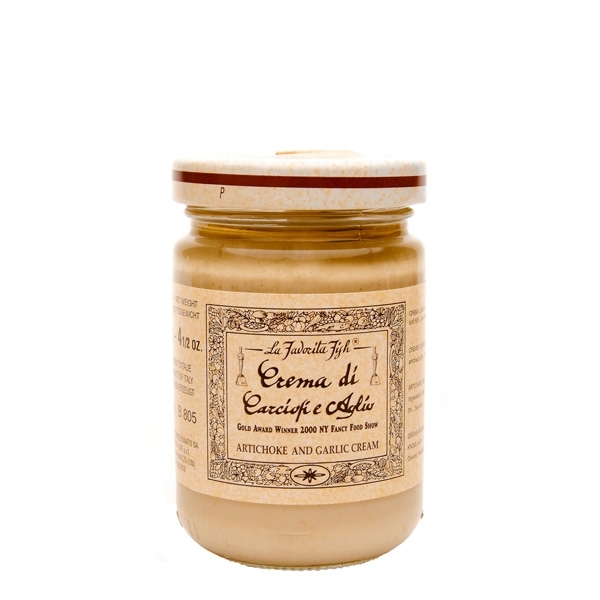 Is there a substitute for the La Favorita Garlic Artichoke sauce in the jar? Thank you. I would mice a garlic clove or two, and sauté it in 3 tablespoons of olive oil. Rinse and chop a canned artichoke heart fine and add it to the garlic. Let it cool before adding to the potatoes.